Art! Do your kids love it? Would they love it more if an experienced and inspiring art teacher were there in your home to instruct them? Mine, too. And so we opened our first See the Light DVD to review it for The Schoolhouse Review Crew, paper and pencils ready to go. I had my 15-year-old son who likes to draw, my 13-year-old daughter, my 12-year-old daughter, and my 9-year-old daughter test the video. In four lessons (each approximately 25 minutes), art instructor Pat Knepley helped them take a project in the style of Louis Comfort Tiffany from the planning stage to finished work. The supply list was simple and short, which I always appreciate. I don't want to have to invest in expensive materials that won't be used again, and I don't want to have to go searching around our little town for the right supplies. One quick shopping "trip" through Amazon and I was set. 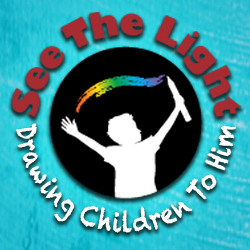 My kids all really enjoyed this project, and they would definitely be interested in doing more from See the Light. You might like knowing that free projects are offered each month, too. Be sure to read the blog for all kinds of great tips and projects, including notebooking pages, copy work, and coloring pages. Master artist Pat Knepley walks students through each step, explaining and instructing clearly. I didn't need to be available to any of my kids while they were working on these, which for me is a great asset of the DVD's. Granted, my youngest child working on it was 9, so I cannot give a good idea of how these might work for a really young child. I'm thinking a 6 or 7-year-old will want an adult at least in earshot in case they miss some aspect of the instruction. The DVD states that the lesson is for ages 10 and up. But if you want a project that isn't mom-intensive (all this mom did was supply the correct materials), then See the Light might be the art curriculum you need. See the Light Tiffany Window project DVD is 14.99. If you're interested in reading more Schoolhouse Review Crew reviews of this product, be sure to click through here. Affiliate links included. I was an affiliate for See the Light before I was asked to review this product for The Schoolhouse Review Crew. You can see my disclosure policy here.